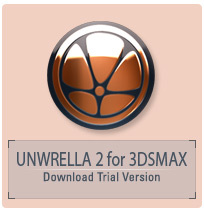 Unwrella is now available in version 2.21 for Autodesk 3ds Max and Autodesk Maya. Unwrella was developed for the high demands of graphics designers in real world production environments and provides a fast, simple and reliable unwrapping solution. It is the first tool of this kind on the market, allowing the unwrapping of 3d models to be done with a single mouse click while simultaneously providing optimal results that combine the minimized texture stretching of automated unwrapping techniques with the efficient space utilization and chunk distribution of UV space that is achieved with manual pelt wrapping methods. This allows users to quickly solve complex tasks like the creation of seamless 3d models, more accurate lightmaps and productive subsequent processing of the UV maps in other 3d applications like ZBrush or Mudbox.